First and foremost I would like to apologize for my absence on this blog. A lot has gone on over the last year and while I look forward to sharing all of that with you in the near future, I am now in the process of finding a better way to re-organize and lay out this website for ease-of-use. So please bare with me a little bit longer as I sort out the kinks to the site. Now Onto the fly tying! Please Join me this Monday, March 25th at 6:30pm for another free fly tying class at Ramsey Outdoor Stores in Succasunna, NJ! I will be teaching three or four simple fly patterns for early trout fishing. The class is free and you only need to bring your vise, tools and some thread (olive, tan and black are good choices in 6/0 or 8/0; all other materials will be supplied. Are you thinking about heading straight from work? Is it possible you may not have time to grab all of your stuff?? Have no fear! 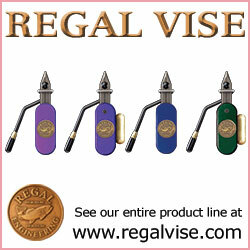 I will be bringing 8 Regal Vises and Tool kits with me that you’ll be available to use during the class on a first come first serve basis, so stop on over!